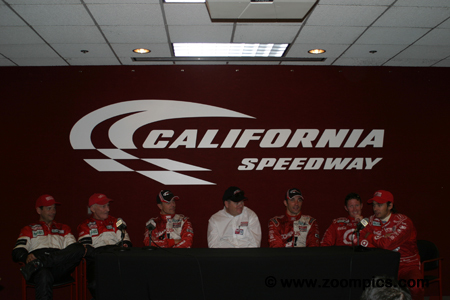 The final race of the 2004 Grand Am Championship took place at California Speedway on the last weekend in October. A total of thirty-seven cars (Daytona Prototype – 15-cars, Grand Touring – 11-cars and Super Grand Sport – 11-cars) were entered to compete on the 17-turn roval for 400-kilometers. All three class titles were on the line. 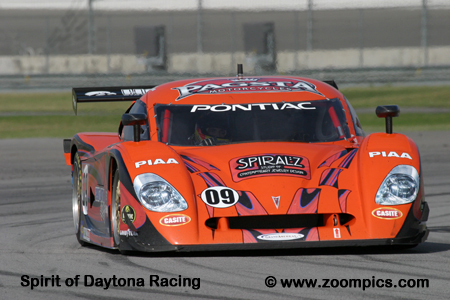 The Daytona Prototype Driver championship was between Wayne Taylor and the Ganassi Racing teammates Scott Pruett & Max Papis. The outcome for Grand Touring and Super Grand Sport titles were less uncertain but still to be decided. The first three grid positions were occupied by Chip Ganassi Racing Rileys. On the pole is the No. 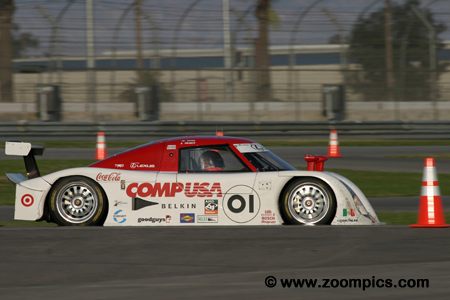 01, shared by point’s leaders Scott Pruett and Max Papis. The outside of the front row is occupied by Ganassi’s IRL IndyCar drivers Scott Dixon and Darren Manning - brought in to support the championship hopes of Pruett and Papis. Heading in to the final event of the season, Scott Pruett and his teammate Max Papis held a three-point lead over Wayne Taylor. Papis got the weekend off to a good start by qualifying on the pole. In the race, the duo led eighty-one of eighty-nine laps and won by a margin of 43.934-seconds. 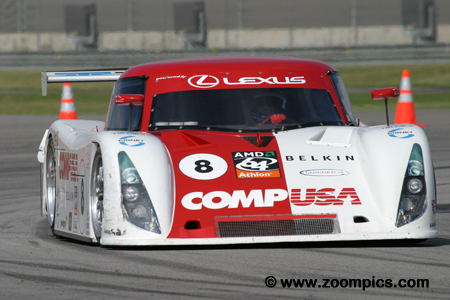 They won the 2004 Daytona Prototype championship by ten points. Capturing the Grand Touring pole-position was Tommy Milner driving the Prototype Technology Group BMW M3 – this was Milner’s second pole of the season. Sharing the No. 16 BMW with Milner was former GM driver Kelly Collins. Milner and Collins were first to the checkered flag and earned the Prototype Technology Group their tenth win of the season. Butch Leitzinger and Elliott Forbes-Robinson won the penultimate round at Barber Motorsports Park. In the season finale, they qualified No. 4 Crawford DP03 behind the three Chip Ganassi Racing entries. Some setbacks for the Ganassi cars, which included the Manning/Dixon car running in to the No. 2 Howard-Boss Motorsports Crawford, allowed Leitzinger and Forbes-Robertson to capture a second place finish. Before the season’s final race, Gene Sigal’s and Harrison Brix’sbest finish was a second in the Super Grand Sport class at Homestead-Miami. 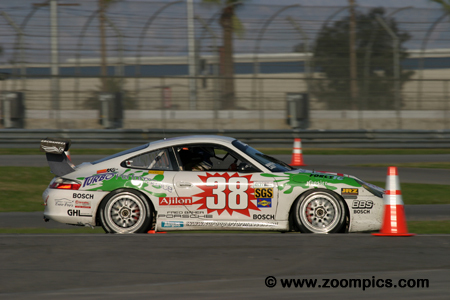 At the finale, they started Grease Monkey Racing Porsche GT3 Cup fourth in the Super Grand Sport category. At the checkered flag, they were nineteenth overall and the pair captured their first class victory. 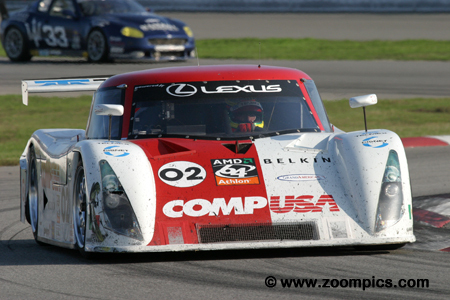 Bill Auberlen led the Grand Touring title by seven points over fellow Prototype Technology Group driver Boris Said. Auberlen shared the No. 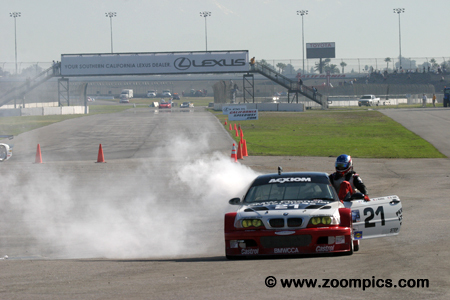 21 BMW M3 with Justin Marks. It did not look promising for him - Mark’s had an engine issue in practice and then during the race the BMW had a fuel pump relay fail. After the problem was resolved, the car returned to the track and the duo finished sixth. The Milner/Collins victory and Auberlen’s eight wins during the season broke a tie which gave him the title. To win the Grand Touring title, Boris Said had to beat Bill Auberlen by eight points. It was looking good for Said when Auberlen’s BMW died on the pit road. He and co-driver Joey Hand finished second while Auberlen was a distant sixth. At the end of the race, Said and Auberlen were tied with 373-points but Auberlen’s eight victories to Said’s five gave Auberlen the championship. 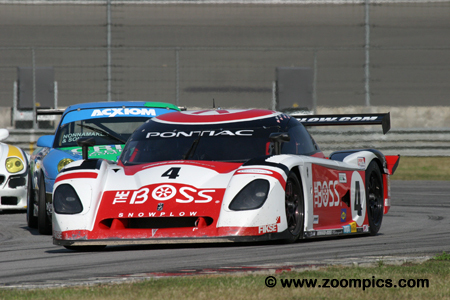 To secure the Daytona Prototype title, Chip Ganassi Racing ‘stacked the deck’ by entering a third car. The No. 8 Riley MK XI was driven by Ganassi’s IndyCar drivers – Darren Manning and Scott Dixon. Manning performed the qualifying duties and was third fastest. In the end, the IndyCar drivers were not necessary as Wayne Taylor and his co-driver Max Angelelli encountered fuel pick up problems which dropped the pair to a fourth place finish. Sharing the No. 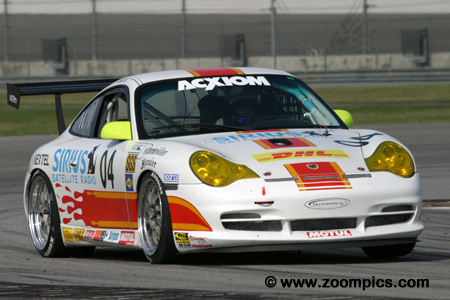 38 TPC Racing Porsche GT3 Cup during the 2004 season were Marc Bunting and Andy Lally. Their chance of winning the Super Grand Sport championship was much more certain than that of the title contenders in the other two classes. Bunting and Lally had to simply complete a green flag race lap to win the championship. Bunting started on the Super Grand Sport class pole and the duo finished second in class. 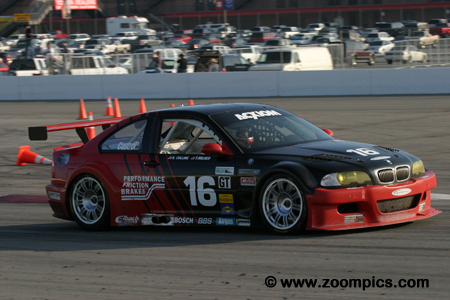 The Prototype Technology Group BMW M3s swept the first three qualifying positions in the Grand Touring category. Starting fourth was the No. 66 The Racer’s Group Porsche GT3RS shared by R.J. Valentine, Chris Gleason and Ian James. When the No. 21 BMW encountered a fuel pump relay failure the group inherited third in class and held the position to the finish. Jimmy Morales handled the qualifying duties, for the No. 02 Chip Ganassi Racing Riley MK XI and was third quickest. Morales shared the car with Luis Diaz. 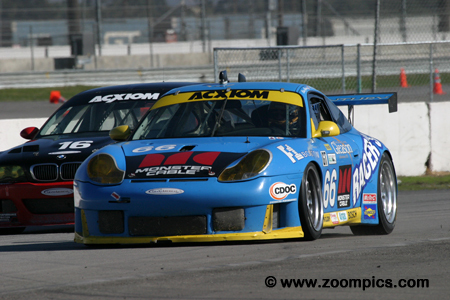 Diaz led the contest for eight laps after Scott Pruett was penalized 55-seconds for a refueling infraction. After their pit-stop, the pair dropped down the race order and were sixth at the checkered flag. The post-race interview for the Daytona Prototype competitors. In the center is the team owner, Chip Ganassi. 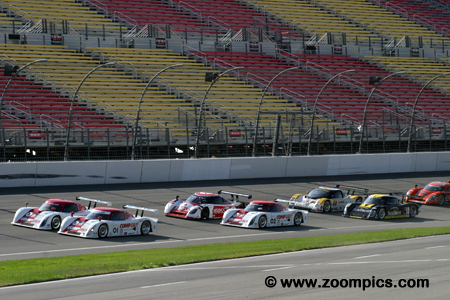 Sitting on either side of Ganassi are the race winners and new Daytona Prototype champions Scott Pruett and Max Papis. This was Papis’ first professional racing title. Second place finishers, Butch Leitzinger and Elliott Forbes-Robinson are sitting on the left. At the other side of the table are Ganassi’s IndyCar drivers Scott Dixon and Darren Manning.